Hello Stampers! Happy Tuesday! 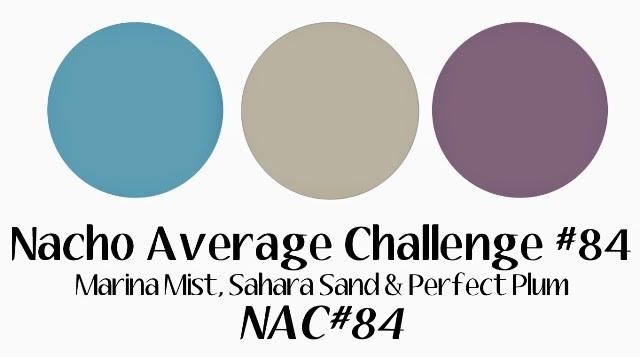 We have a beautiful new color challenge for you starting today at Nacho Average Challenges that we hope it will inspire you to create along with us. I'm so excited to show you my creation for our challenge this week. These colors inspired me to ink up a stamp set that I had not yet inked, Daydream Medallions. I used white and black embossing powders to make the flower images stand out. Here is another view of the front, you can see the interlocking part of the card. I love it and I think I have a new addiction to making this type of card. It's just so cool! Amazing what can you do with paper! This is the inside of my card. Do you ever amaze yourself and think, "WOW, I created this", well, that's what I've been thinking every time I see this card now. A huge thanks to fellow Stampin' Up! Demonstrator Julie Davison for her tutorial on how to create this interlocking framelits card. Thank you Julie!